Happenings from the MWF 203 class! Our class greeted 2015, by singing goodbye to December 2014 and hello to January 2015. As we read the book Calendar, we talked about what occurs in each of the 12 months and who in our class has a birthday in that month of the year. Everyone made a 2015 calendar and to personalize each one’s calendar, we highlighted their special day and month (their birthdays). On our birthday graph, each child placed a square in their birth month row and we discovered that the month of May had the most birthdays. Our class is very enthusiastic when singing our month-a-rena song (a song that names the months of the year accompanied by the motions of the Macarena). One of our winter projects was making matching mittens. After cutting mittens, each child chose 5 shapes to place on one mitten and replicated the placement of those shapes on the other mitten. Our colorful mittens decorated the walls at Barnes & Noble for our book fair and in Fellowship Hall for Preschool Sunday. In our classroom, we had fun matching mittens and in our book, A Pair of Socks, we matched pairs of socks. Each day, during circle time, we add another numeral to our day chart. Last week, we reached the numeral 50 and celebrated our 50th day of school. We sang a “50 days of school” song. 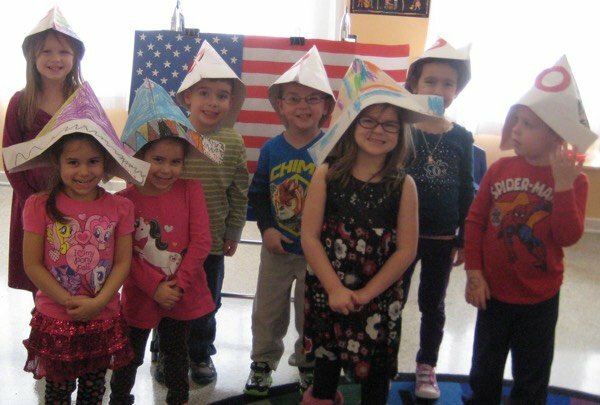 To celebrate, the class decorated paper hats and glued on the numeral 50. We created an American flag, with each child placing stars on the flag’s blue portion, representing our 50 states. Some of us enjoyed assembling a floor puzzle of the United States and others played with 50 small pieces of fruit in the dramatic play area. At snack time, as we counted together, each child removed 50 small pretzel sticks from their individual pretzel bag. The last day of the month is Fathers’ Saturday. Each child made a paper shirt and designed an original tie to place on it. Inside the shirt, the Dads will find some interesting facts about themselves. We also made a cookie snack for our dads to enjoy. We followed a recipe, measured and mixed the ingredients (noting how the mixture changed with the addition of each ingredient) and then dropped spoonfuls of the batter on the cookie sheets to make some delicious chocolate chip cookies. All of the classes were busy making decorations for Fellowship Hall for Football Friday and Fathers’ Saturday. Our class cut and laced footballs and decorated Super Bowl pennants. Football Friday in gym class was great fun for all. After a football theme warm-up, everyone had the opportunity to toss a football to a partner, to throw footballs into a ring target, and to toss footballs into a board target. Each month to highlight our color and shape of the month, we use that color and shape on our name tags. This month our black and white rectangle name tags contain our birth month and day. Every month, our class is eager to learn the Spanish name for that month’s color by singing our Spanish color song. 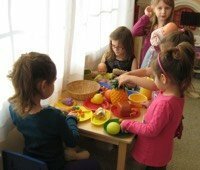 Our days are very busy, filled with play and discovery. Many classroom conversations and learning experiences occur from simple observations, comments or questions from the children.